This is part 1 of our coverage of Guardians of the Galaxy Vol2. Lola VFX has provided some of the most stunning de-aging work, (and the first de-aged kiss) in Guardian of the Galaxy Vol.2 . 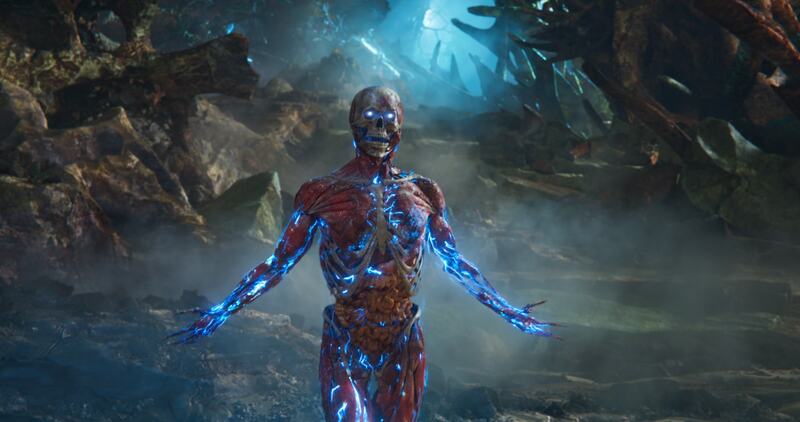 Lola VFX is already the 'go to' Marvel Studio vendor for such effects, having provided 'Skinny Steve', and numerous other sequence in a host of Marvel films. Young Ego represents the largest age jump back in time in the Marvel Cinematic vfx universe, some 36 years for legendary actor Kurt Russell. In the film, Russell plays Star Lord's long lost Dad, Ego. Trent Claus was visual effects supervisor, and along with the team at Lola VFX, they produced not only young Kurt Russell, but added to various characters such as Nebula. Some parts of the film press have written, inaccurately, that Young Ego was achieved with on set special effects makeup, others state that it was achieved with 3D animation. Both are completely inaccurate. 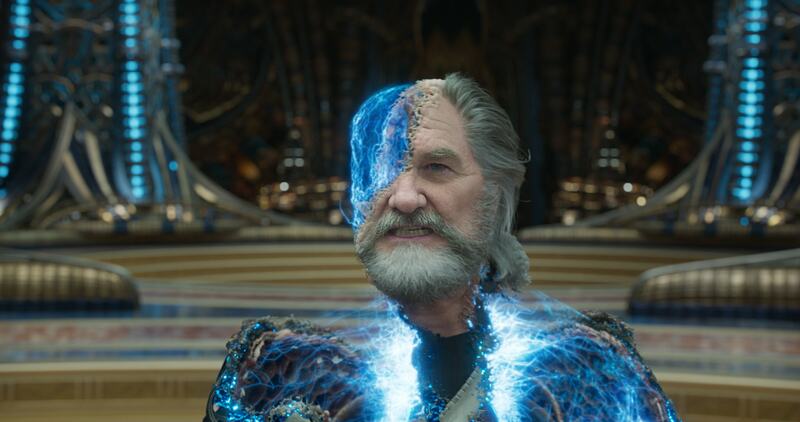 While Kurt Russell did wear a 'Farrah Fawcett' wig, all of the de-aging was once again done by compositors at Lola VFX in LA, as we found our when Trent Claus sat down with fxguide's Mike Seymour to discuss their complex and nearly flawless visual effects work. 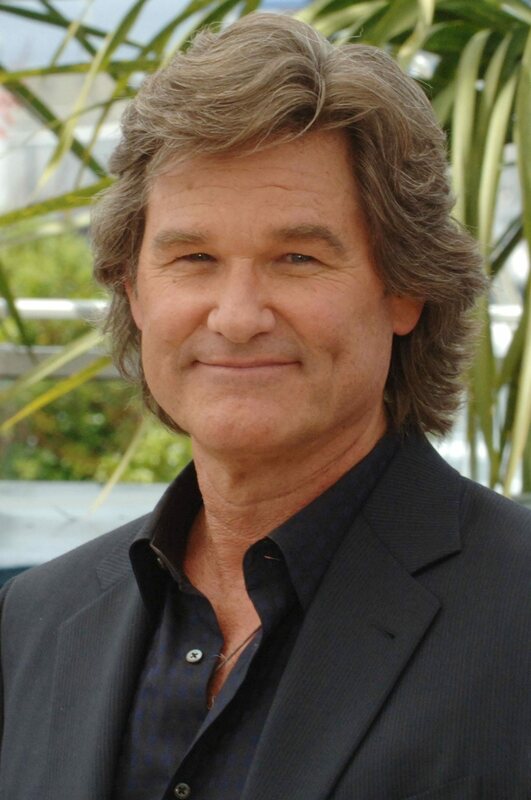 Kurt Russell - at different actual ages in his career. FXG: This seems like some of the most complex work you have done ? TC: Unlike Antman, and some other films, with nearly locked off cameras, this was big helicopter moves around the car and through the windshield, with Farrah Fawcett hair flying, .. and our first de-aged kiss which was something new and different to achieve. FXG: What did you have to work with? What was the base plate photography that you built your work upon? TC: The base plate was Kurt, he wore a wig and no special fx makeup just some tracking marks. We also had a younger double stand in. We shot him after Kurt, he did not have a wig, but he had matching tracking marks on his face (to those of Kurt Russell). In this movie every shot of Kurt is Kurt Russell, we never used the other younger actor for wide full body shots or even when his face is away from camera as they run down into the bushes. It is just Kurt - for all of them. FXG: Is this still a 2D solution? Without 3D rendering or elements? TC: Yeah we still use a 2D solution, we do track everything in 3D, - then depending on the shot we may do a head track in 3D, .. all the compositing is done in 2D and there are no 3D elements that are used or blended in, - there is no animated 3D face. It is all 2D elements. FXG: He seems to be very like Kurt in Escape from NY, but that is not a great reference as he has an eye patch in that film! TC: Yeah funny you mention that, because the director James Gunn, wanted that as his target age for Kurt. We would have loved to have used Escape from NY, but he not only has the eye patch but he also a five o'clock shadow in that movie that didn't really match. While we could look at it for some reference, for example how his skin folds and moves... we couldn't use it as the base reference we needed. We actually referenced Used Cars which came out just a few months prior to Escape from NY. It was an early Robert Zemeckis movie and that film was a god send, - Kurt was clean shaven and he had a lot of the action we were looking for, - such as big smiles and dialogue while smiling, so it turned out to be just perfect for us. FXG: If my maths is correct, that makes the de-aging in Guardians equal to about 36 or 37 years? FXG: But in Used Cars, he did not have the big hair, so moving forward on this film you were aiming to get the hair right in camera? TC: It worked out great, our preferred method is that the filmmakers get the hair a 100% what they want on set, because it is much easier to work around the practical hair than try and create 3D Hair,. We would much prefer on any production that the filmmakers get it to a point they want and then we will work around it. In this case it worked out great, there were no points where it flew across Kurt's face... there were no flyaways crossing his face or eyes that we had to clean up. It really worked out great. FXG: But I guess you do get the right shadows and contact points from the hair across the face, even if the face needed work? TC: Yes we have the exactly correct shadows, so even if we have to remove all those shadows as part of the process, we have all that information to match back to when we reintroduce them. TC: Everybody ages differently of course. Everyone sinks a little lower, you get more around the jowl and the chin.. and the lips get thinner and curl in more towards the teeth. The nose and ears get bigger, and the eyes sag. Actually, one thing we fight a lot is that the upper eye lids start to sag over the eye balls, as you get older. The natural tendency (in real life) is to raise your eyebrows as you get older - just so you can see better. This is something people do unconsciously. But as you are trying to de-age someone, if you just digitally remove the sag it looks like they are always surprised. Since their eyebrows are now digitally higher than they would have been when they were back at the 'younger' target age. We have to therefore adjust the eyebrows down. With Kurt his cheeks got a little larger, it was not just an issue of someone who's face had aged with wrinkles. FXG: I assume it is not just the face (hockey mask) but also his neck? Where did you stop or blend back to? TC: Well in the film he has a fairly high collar which saved us a lot of work. There is definitely still a lot of work around the adam's apple that is difficult. That is the area we typically rely the most on the elements we gather from the younger stand-in actor or body double. There is always just so much of a geometry change which affects the silhouette and the shadowing. You can't just remove the wrinkles, you have to rebuild the musculature and the way the skin moves against the throat. FXG: If I can ask you a related question - not about any actor in this film - but away from this film, as a point of comparison, in the real world people have face lifts and plastic surgery. Often they look horrible. 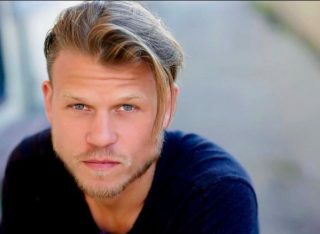 Is there a risk that you can fall into an actor looking like you have given them digital plastic surgery compared to de-aging as we have been discussing? TC: Absolutely. I think everyone can identify that look, even if they don't know exactly what they are seeing. They can just tell, so it is something that we fight against, and something that we are very aware of, for example we need to make sure if we have multiple artists working on an actor over different shots that our solution is consistent. FXG: Are there characteristics that you would identify and say - 'that is producing a plastic surgery look' compared to a de-aged solution? TC: There are definitely things that surgeons do that are different from what we can do. They have no other option, but we would never do it, such as the stretching of the skin to remove the crows feet around the eyes. They tend to make an incision along the hairline and then pull that skin back. That gives a different result to the actual shape of the eye. The eyebrow also gets stretched which again looks unnatural. But, of course, we don't need to make an incision, we can just remove stuff. FXG: So young skin has a softness and elasticity that provides no wrinkles, whereas the surgeon is trying to emulate that smooth skin by stretching it flat? TC: On top of that the quality of the skin is quite different, the amount of blood flow is quite different between say a 20 year old and a sixty year old. The sub surface scatter and the amount of red scattering varies, especially in the cheeks and the end of the nose. On the end of an older man's nose the skin is pasty, - and is less red (pink) with the exception of little red and purple capillaries that break as you get older, so you have a mix of yellowish grey skin mixed with these little mini capillaries that you can see - all of which definitely doesn't say youth. FXG: It is interesting that you mention sub-surface, as you are not modelling SSS in 3D as this is all compositing, right? TC: Yes we are thinking of it in terms of a painting. Light, shadow and colour. FXG: The other aspects we have not discussed of skin quality is liver spots and decolourisation? TC: There is a lot more than people tend to notice, unless you A/B between younger and older. There are lots of areas, for example there are patches that appear dark, which is what most people assume is a liver spot, and those are easy to see, but there are also larger more globular areas of discolouration which are all over the face, and as a whole you don't notice. Once you remove one you can really see the difference and you realise you need to remove (or equalise out) all these regions across the whole face. There is a lot of that style of thing that you can't see unless you AB. But the moles and marks we try and keep, as they are age independent. Sometimes we even have to exaggerate them, as a mole is normally darker when you are younger. It grows but bleaches out as you grow older. So we have to clean up the edges and then grade them for the younger face. Kurt also has a two scars one on his nose and one on his chin and we need to not lose them as part of removing the wrinkles. FXG: As we have discussed there is no 3D face. On such a huge jump in time, is there enough smooth skin on the actor to work with? What is the 'source material' for the comp in other words? TC: Usually there is enough, some areas are more difficult than others. The forehead we can normally do it with what we have on the actor, there is enough smooth skin to work with. Around the eyes and the eyelids, can be a problem, sometimes the upper skin has completely rolled over the eyelid so we would have to completely recreate the eyelids in comp. We typically use matte paintings or we can sample and steal from the younger model. We can lift them, recolour them, and track them in. FXG: Can we discuss that younger stand in? How do you use them? Do you look for someone who overall looks like the actor, or do you pick them based on specifically to do this scene, for example : we need them to look like Kurt around the eyes? TC: With Kurt, it was really all about the jaw and the shape around the mouth, it did not really matter that he looked like Kurt - we were looking for specific features: we needed a big broad jaw, chin, and most importantly the way the laugh lines move and crease as he talks. If we were blue sky dreaming : we wanted Kurt's dimples. FXG: Do you get involved in casting them? If you had two actors to consider... both are possible - one is a very close match but not exactly that target age - the other is exactly the right age but the dimensions are slightly off.. which would you pick? TC: We'd go with the features, so long as they are within a ten year period - (+/- 5 years) we'd prefer the best match of features. The age isn't as important - it is more about the geometry. FXG: So you are involved with the casting agent? TC: Yes we get to be involved in the casting. If someone is cast as a double who is young but doesn't look like say Kurt that would not be very helpful. But a body double is very important. Marvel has been fantastic. They put out a net for a set of good candidates and then they send over some actors for us to consider. FXG: Are you playing back Kurt's performance on set, so the stand-in actor can lip sync to his dialogue to get the right timing? TC: No, they need to be a fairly good mimic, we want the right expression at the right time but we really have to factor in their acting ability. It is really complicated for an actor to do. If we have a fantastic actor that can hit every mark but not a perfect facial match I would take him over a guy that looks perfect but can't hit their mark. We aren't after lip sync, I always like to have them on set watching say Kurt perform, so they can immediately do their performance while it is fresh in their minds, but I ask them to say the lines themselves - be the character and act the scene as close as they can to Kurt. If the timing is slightly off we can timewarp it later in post, so long as they are facing the right way (to the light and camera), we can fix it up later. In this case we were lucky to work with Aaron Schwartz. Sometimes we would track in a texture, sometimes it is a patch of a clip with changing light, as it is 2D - so whatever works. But to be clear - it is always Kurt's plate photography, his eyes, his base face and performance in every shot. FXG: Well great work again - thanks. Weta Digital handled much of the third act of the film, while we will be covering the rest of their work in later parts of this series, a key component was the suppression and attempted killing of Ego, when Peter Quill discovers Ego killed Meredith Quill, Star-Lord's mother. "He was an interesting guy, we had to have him fly around, but also he had the ability to reform and come back to life, so a pretty complicated character", commented Clayton. Even for some 'normal shots', the team at Weta had to create and use a digital double of the actor, "of course he resolved into a digital character at the end, but you would probably be surprised at how much of Kurt Russell was digital" Clayton adds. The character had a celestial blue light which was a signature aspect of the character and very clear when we see Ego reforming. 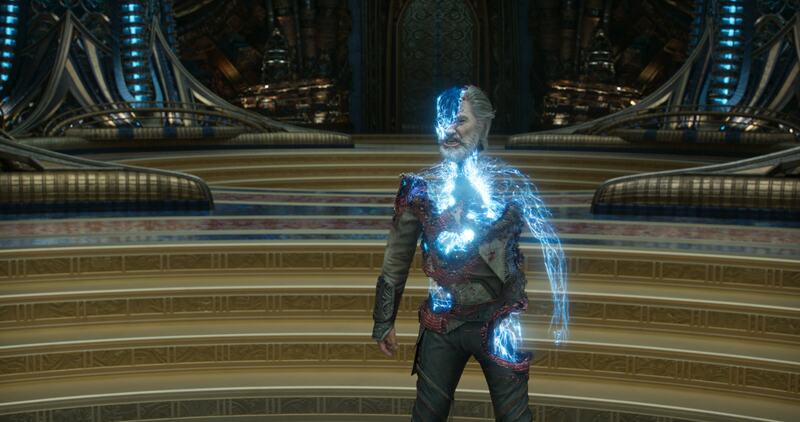 Interestingly, the blue light does not play much on the actual 'normal' parts of his face or body, due to the celestial light inherently being contained inside his body, but the whole character was plausibly lit, all the glows one sees were generated in the render and not a post composite process so Williams is confident that if such a character existed; this is how they would look. "We render everything now in Manuka, our spectral path tracer, and we tend to render everything together, so his head and the blue light cage, (celestial light), whatever value of blue was hitting the camera and looking like a blue line, was also being emitted into the volume of the geometry around it and not just lighting the surfaces around it but also sub surface blue, ... it is all path traced properly" explained Williams. 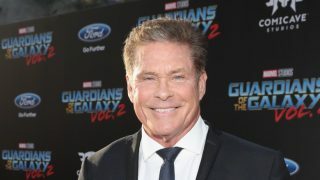 Not only did the team make a digital double to accurate make Ego look like Kurt Russell but the team also had to make a digital David "The Hoff" Hasselhoff, for the brief period that Ego offers an alternative father figure. "We tried morphing to a live action Hoff - but it did not hold up as well. The Kurt version looked better than the Hoff version,..and while we had built a very detailed Kurt digi-double,- we didn't want to go to the same level on the Hoff for just two shots. But in the end we did have to do a partial build digi-double of the Hoff" explained Williams. "The reason we did the Kurt digi-double in the first place was to make sure all the effects stuck correctly to the body, so we weren't trying to do all this pixel level tracking of the effects... so we went with the approach of a full digi-double, the hair, the side of the face everything on Kurt. 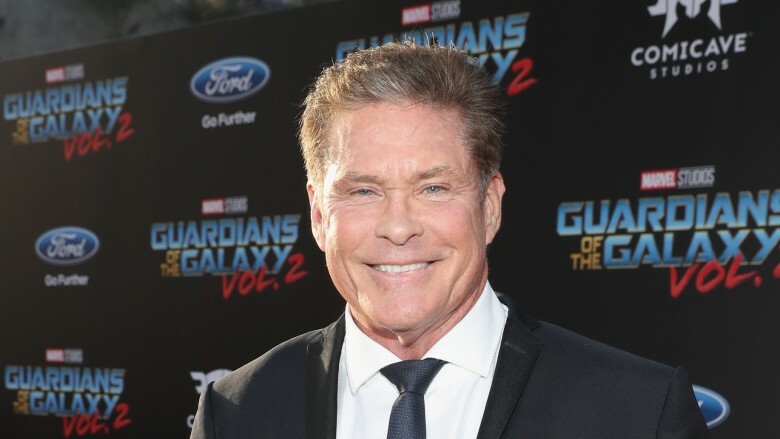 For the Hoff, we got pretty close, but it is not quite as detailed as for Kurt, ... and it was the right decision - it works - if you watch we grow the hair back between the two of them, their hair grows over time, it does not just appear as they change between the two versions of Ego". Clayton is the first to point out that perhaps lighting realism was not the yardstick Weta aimed to be judged by. "Hey, it is Guardians of the Galaxy - so we were thinking about Iron Maiden album covers covers, ..we were having a lot of fun with it, and not disregarding photorealism but putting that a little to one side and aiming for a cool overall impression" he laughingly remarked. Ego and the Guardians universe is somewhat of a change for Weta, even with movies such as Planet of the Apes or The Hobbit, the look is still very much grounded in a strict live action world and not the colour saturated, super hero world of the Marvel characters with dancing trees and talking weapon blasting raccoons. "James Gunn likes things to be quite extraordinary", explains Clayton. In one shot after the team have crashed their laser drill spacecraft onto Kurt Russell - "and then as they are getting ready to escape Ego is starting to form up again in front of the windshield, and Quill says "Well of course I have issues, that's my freaking father!" The previz just had Ego rising up in a key pose, and because we were trying to honor the previz our first pass was just like that, and then James Gunn said "no no, he should be shaking and going crazy". So Clayton and the Weta team shot "this ridiculous reference of us shaking - sticking our tongues out - going crazy" and then they animated to the new reference for Ego, and Director James Gunn "loved it - the more out there for this universe the better - and it works in the final shot". Weta Digital's primary work started in the film once Ego tells Quill he put the cancer in Peter Quill's mother and it continues covering the final huge battle. The project, while split over several vendors, still required Weta to work on the film for a year and as we will see in the next fxguide story on Guardians, this film contained one of the most complex shots Weta Digital has ever done. Keep an eye out for more Guardians' coverage here at fxguide on both the character and the environment work.